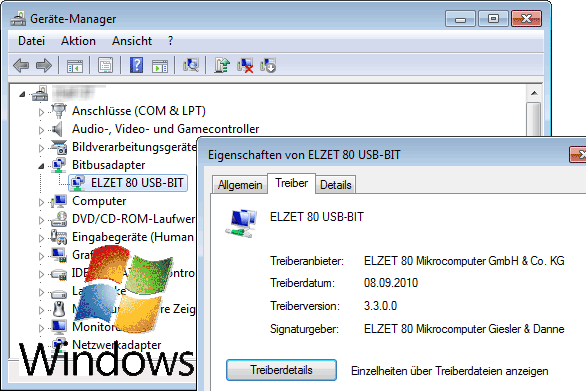 This is the software you need to access BITBUS through our PC-boards or USB-adapter under Microsoft Windows®. Your application "talks" to bapi.dll using the BAPI application interface as defined by the BITBUS European Users Group. On the Windows side, this interrupt driver conforms to the WDM (Windows Driver Model) as used in all recent versions of Windows. The licence is required once only per customer and covers half a year of limited e-mail support. BAPI is used for our Linux driver and Ethernet, too. One-time-license for use in one project with 1/2 year limited e-mail support for one contact person. Includes driver-updates. Support renewal or additional contact for 1 year. The BITWDM Windows® driver can access up to six ELZET80 PC boards in any mixture of PCIe, PCI, ISA, PC/104 etc. in one computer. Up to 16 different applications can connect to one or more of the 6 boards, allowing concurrent access from service, visualisation and control programs. BITWDM supports outstanding messages, which means that you can safely send at least 6 requests to a slave before having to fetch the answers. The driver comes with a pre-compiled test program "linetest" that continually sends messages (RAC/GBS Get_Node_INFO) to a slave while counting messages and possible errors. This program is provided in source in C, C# and VB as a starting point for your own programming. If you move to ELZET80 boards from other manufacturers of old non-PCI boards, you will be faced with rewriting your application to work with the newer boards. However, once having switched over to BAPI, you can access the entire range of PC-boards, USB and even the Ethernet BAPI servers (ETH-BIT) all over one common interface. BAPI programming is easy, please check the BAPI tab on the BITBUS basics page for an introduction. All the datails can be found in the BAPI (BITBUS Application Programmers Interface) specification. And - while your interest in BITBUS lasts - we will continue to provide you with the latest in hardware so you can access your BITBUS slaves from state-of-the-art control and visualization stations. 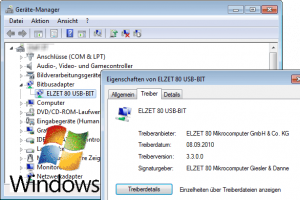 While ELZET80 has provided BAPI compatible drivers since their inception, drivers for the older versions of Windows are only available for support cases. We now encourage the use of at least WindowsXP for your new application. Both 32- and 64-bit-versions are supported, multiple cores and hyperthreading are tolerated.